Choosing the proper equipment is essential to improve your game and lower your score. Most golfers, whether beginning or pro golfers, struggle when trying to decide which golf club to buy. The buying process becomes easier when the golfer has a good understanding of the types of golf clubs available and their specific use. For the novice golfer, using the proper type of golf club will help to learn quickly and achieve results. According to USGA rules, a player is allowed to carry up to 14 clubs. However, beginner golfers don’t really need all 14 clubs. The basic set of golf clubs for a novice player usually consists of a driver, an iron and a putter. Choosing the right type of club will help with swing speed and correct faults that will improve your game and your score. Golf clubs come in different types, styles and materials, each with their specific use. For shorter shots, irons may be the best option. Irons are usually sold in sets that include different sizes. Apart from the type of golf club, the shaft’s material (graphite or steel) as well as the shaft flex, shaft torque and shaft length are also important factors in a club’s selection. One of the less expensive materials for a shaft is steel. Clubs with a steel shaft are heavier but are usually more durable and less expensive. The steel shaft may also give you more control over your faster swings. Graphite shaft will be lighter than steel, but will be more expensive. This type of club is used for long distance shots or for slower swingers (women, juniors and seniors). Drivers and fairway woods generally come with a graphite shaft, while irons exist with a steel or graphite shaft. Beginners usually benefit from a graphite shaft. The flexibility of a shaft is referred to as flex, or bend. Shafts come in a variety of flexes. Flex is important because if the flex of your golf club’s shaft doesn’t match the needs of your swing, the clubface will be misaligned at impact, causing your shots to go off-target. So, your flex will impact how straight you hit the ball, how high or low it goes and how long or short it travels. For more info on how to choose the right shaft flex for your game read How to choose the right shaft flex for your golf clubs. As a general rule one can say that a stiffer shaft will produce a lower flight, shorter distance and increased accuracy, while a more flexible shaft will produce a higher shot, but more left/right variance and a little more distance. Depending on the type of directional problems and the accuracy problems golfers may need a different flex type. For more information on shaft flex see: Shaft flex and shaft torque. According to Jack Moorehouse, most high-handicappers (especially men) tend to over-swing. If this describes you, you should consider a softer flex to help you slow your swing down. Slowing down the swing will certainly produce more accurate shots and better distance control. For more info read How to choose the right shaft flex for your golf clubs. The difference in shaft torque will usually not be noticeable to the average golfer. Note that the latest generation of driver shafts combine a flexible shaft with a stiff tip, giving the golfer the required flex to “whip” into the ball while reducing clubhead twisting. For more information on shaft torque see: Shaft flex and shaft torque. Irons come with a cavity-back and blade design. Cavity-backed design is more forgiving, as they move more weight to the periphery of the iron head, making it easier to get the ball off the ground and making bad shots not as tragic as they would be with blades. They are therefore the best option for beginners. Blades, however, allow experienced players to shape shots better. So they retain certain advantages for low handicappers. Some beginner sets also allow to replace long irons with hybrid clubs, a cross between long irons and fairway woods, which is a good choice when you want to obtain fast results. In addition to clubs, you will also need a golf bag to help you move from green to green, and of course, golf balls. Golf balls are probably the most overlooked piece of equipment, both by novice players and more experienced golfers. A good knowledge of a golf ball’s characteristics, such as compression, spin and distance can prove helpful in enhancing your strengths and masking your weaknesses on the golf course. Read more about this topic in our article about golf balls. 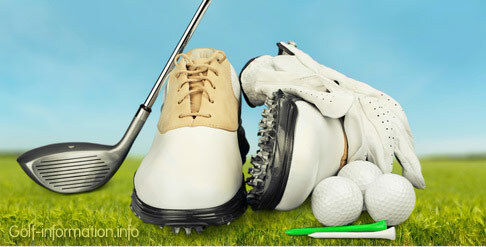 The choice of a good pair of golf shoes is also an important asset in your equipment. Good golf shoes will help stabilize your body, which is essential to achieve the perfect swing. Golf shoes are also designed to handle the hilly or slippery terrains more comfortably. Other accessories include golf tees, golf gloves, a golf cap, clothing, and possibly sunglasses, as well as covers for your golf clubs to protect them from the weather conditions or while being stored.